My favorite type of coloring book to color in are the more complicated ones. I think that’s what first drew me to Johanna Basford’s books were her inky treasure hunts on each page. She has so many gorgeous details hiding throughout the pages. But since our Queen has caused the coloring sensation many other illustrators have started creating amazing intricate, complicated coloring books for adults to color in. A curated list of my favorites is below. No list of complicated coloring could skip the amazing illustrator Kerby Rosanes. His newest book launched April of 2017 and it as spectacular as his first two. Bennet Klein has come to the top of the newest sensational illustrators with both fine line illustrations and grayscale drawings that are both wildly unique and intricately detailed. His latest book is Dragons. All of the Bennett Klein Books are listed here. This unique coloring book is one-sided other than bottom left corner of each facing page which holds a small cat illustration that when you flip the pages works like a flip-book. The other side of the page features gorgeous images of the adventures of a bicycle and a cat as they roam through town and countrysides. It seems as if the most complicated coloring books are from artists and illustrators outside of the United States. This gorgeous detailed complicated coloring book just became available to the US/UK market, just take a look at some of the pages on Instagram here. This second edition contains 60 unique hand-drawn illustrations printed on both sides of the perforated pages. It is also spiral bound on 100-pound thick paper stock. The second edition is reported to be much better than the first, the designs are not quite as tiny and the paper is nicer quality. Tim Jeffs now has to intricately detailed coloring books on the market now. I have the first one and the interesting difference of this book than most is that it open on the top, so no worries about where your hand rests or if you are right or left handed. Jeffs began experimenting with animal art during his free time. As his sketchbook filled with complex illustrations of creatures large and small, he realized he had found a powerful art form. Once he decides upon a subject, a thirty-plus-hour process unfolds. Jeffs first researches the animal’s habits, habitats, conservation status, and physical appearance. Using pen and ink and colored pencils, he channels his findings and artistic passion into creating an animal portrait on Bristol board. “Then,” the artist says, “I cover the subject with a styled pattern of my own creation. It’s almost like creating a mosaic of lines, shapes, or colors. Not so much photorealism but more of an impressionistic approach that creates a realistic view.” It’s the alchemy of science and creative license. Illustrated by James Gulliver Hancock (You can’t help but notice the middle name!) He has written several books on “how to draw” books and this book looks really fun to explore. This was always one of my favorite stories as a child. Kanoku Egadu is a gorgeous book that Chris Cheng has been coloring in lately. 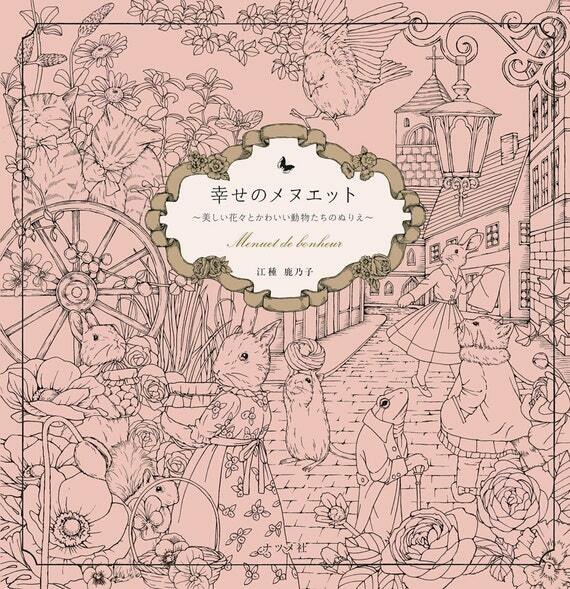 Menuet de Bonheur Colouring Book by Kanoko Egadu or Rhapsody in the Forest II. Japanese coloring books have a very distinctive style with loads of minute details that are just aching to have color applied to them. 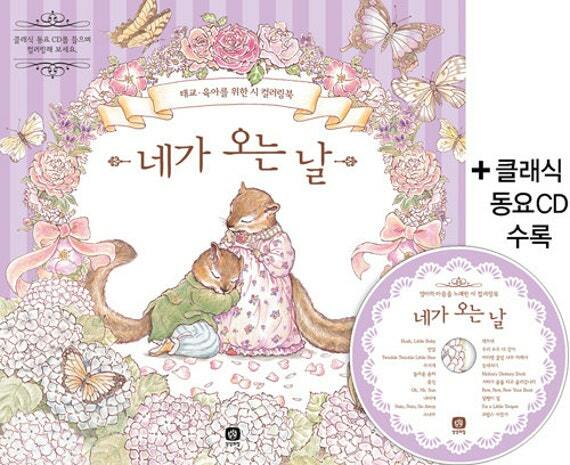 “The Day we Finally Meet” a Korean Coloring book has adorable forest animal scenes to enjoy here. Daria Song was my first foray into complicated coloring and her books are so magical. Luscious thick paper printed with pictures on both sides of the paper telling a story. In all of Daria’s books, you get to travel along with her to her childhood imagination and then out into the pages that her talented hands create and illustrate. This first book “The Time Garden ” has a little red-headed girl escaping from a coo coo clock and exploring the big beautiful world outside. My best advice is to not stick to a traditional color palette and let your creativity wander while you fill in these gorgeous illustrations with color. Korean artist Daria Song’s sequel to The Time Garden takes readers on a visual journey into a magical nighttime world seen through the eyes of that same little ginger girl. This second book in best-selling Korean artist Daria Song’s coloring series features the voyage of a fairy who, when the cuckoo clock chimes midnight, enters the human world. To the tiny fairy, everything seems enormous and magical, from the curtains to the chandelier to a mystical rowboat that takes her further into an inky adventure. Filled with the imaginative, intricately detailed illustrations Song’s readers have come to love, The Time Chamber presents a view of our world made new—and ready for coloring. Illustrated by Eriy in a unique way by using toothpicks to draw the illustrations. Inside are pages and pages of provincial delights for you to bring to life through coloring: magical forests filled with fairies, delightful town squares bustling with people, whimsical village scenes, charming castles with towers―and so much more, sure to delight people of all ages. I would love some of these. But, what’s hard for me is that I like to color everything digitally from my iPad. I see so many coloring books I want that are ONLY paperback. It’s hard to find many great ebooks. I’ve looked and looked for ones from Johanna Basford. There are a few PDF sample pages online of hers. But, her books are only paperback. If anyone knows of somewhere that has a good selection of adult coloring PDF collections or ebooks, please reply. I already know about Kindle and Etsy. I would explore Etsy! many illustrators have digital versions of their books there. Johanna Basford has a few exclusive one’s on the Canon app but it’s only for Canon Copier customers.